Be the first to share your favorite memory, photo or story of Joan . This memorial page is dedicated for family, friends and future generations to celebrate the life of their loved one. Joan (Bowers) Lawson was born May 17, 1928, on her family farm near Conway, Iowa the daughter of William Bowers and Ruth (Rankin) Bowers. Her father died when she was a baby and her mother, an RN, went to work to support Joan and her two sisters. Joan grew up attending school in Clarinda and began working at the Clarinda Hospital her junior year of high school. Following her graduation Joan began working at the State Hospital in Clarinda. On February 20, 1949, she was united in marriage to Harold Albert Lawson at the United Methodist Church in Clarinda. To this loving union two sons were born, Stuart and Vance. Joan and Harold made their home in the Bedford / Gravity area. Together they enjoyed farming and the lifestyle it provided. Joan loved raising huge vegetable gardens as well as many flower gardens around the farmstead. Joan always enjoyed visiting with her family and neighbors when they came to visit. Joan and Harold enjoyed traveling. Joan became an avid quilter in her later years. 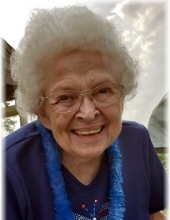 Joan had a true spirit to help others and once again began a career in caring for people in need, when she began working at the Bedford Nursing Home. A position she loved before retiring after 26 years. Joan was a member of the Gravity United Methodist Church and when it combined with the Bedford United Methodist Church, she transferred her membership. Left to cherish Joan's memory are two sons, Stuart Lawson and wife Sandi of Hopkins, Missouri; and Vance Lawson and wife Betty of Creston; a grandson Shawn Lawson and wife Jacque; a granddaughter Stephanie De Leon; six great-grandchildren Jordan De Leon, Cadyn Lawson, Jasmyn Lawson, Matthew Lawson, Jayneigh Lawson, and Harold Lawson; along with many other relatives and friends. Preceding Joan in death were her husband Harold; her parents William and Ruth Bowers; sisters Mary Lou Harkins and Sarah Jane Huggins and a half-brother Floyd Bowers. Joan was a devoted wife, mother, grandmother and great-grandmother. Her love and gentle kindness will be missed by all who knew and loved her. May be given in her name. "Email Address" would like to share the life celebration of Joan Lawson. Click on the "link" to go to share a favorite memory or leave a condolence message for the family.